Disclaimer. This article and those that precede or follow are not intended to be a substitute for reading the official Free-mo standards for HO scale at http://www.freemo.org/standard. This and other articles published herein do not represent any attempt to cover all of the standards. Our primary purpose is to provide a starting point for new Free-mo modelers and to share the experiences of current modelers as they went through the process of building their first modules. The author(s) also wish to acknowledge that some clubs and Free-mo groups or gauges other than HO have added “local” standards that go beyond the “official” ones. We have made no effort to review or include all such “super-standards” but want to recognize that they are often valuable and worthy of your consideration. Also realize Free-mo just recently updated electrical standards, some of which are already in effect or will come fully into effect in 2016. We refer to the new standards here, assuming that those building modules will want to be compliant with the new standards, rather than undertake a re-wiring project shortly. That said, let us begin. You’ve built the module and laid some track; now it’s time to focus on providing a path for electrons to get engines rolling. While electrical work can seem daunting given what is under some modules (Figure 1), don’t be intimidated, it is not at all difficult. Completing a module from start to finish is rewarding, and doing the wiring yourself contributes to that accomplishment. Let’s have a look at what’s needed under the tracks to make everything purr. Figure 1. A contrast of simple and complex electrical wiring on the bottom of modules. Both of these meet the electrical standards, but the degree of complexity depends on what is topside. There are four things you need as part of the electrical installation with your module (S4.1): i) power to the tracks - this is done via what is called the track bus (2 wires); ii) a means to power other things (building / street / yard lights, switch machines – if you use them - and anything else that goes gee-whizz-bang and requires power) - this is done via the accessory bus (2 wires); iii) a single wire booster common (S4.16); and iv) a means to pass digital command control (DCC) information through your module – the LocoNet bus cable (a telephone type 6-conductor cable S4.3). For the track and accessory bus, as well as the booster common, all wires shall be stranded AWG 14 or larger (S4.2, 4.16). Note that in the American Wire Gauge (AWG) system, wire diameter decreases as the gauge number increases; this is related to the number of times a wire must be drawn through dies to achieve a desired diameter (https://en.wikipedia.org/wiki/American_wire_gauge). To hook up the bus wires under the module, a 4 (or more) position barrier strip at each end is required (S4.4; see left part of Figure 1 and Figure 3A). The barrier strip also provides a handy place at which to attach the 18” ‘free ends’ (RP 4.1) to electrically connect the module to others. The barrier strips also provide a quick way to troubleshoot wiring, should that become necessary. After a change in the standards in 2015, Anderson Power Pole connectors are used on all free bus wire ends (except the LocoNet/DCC cable). These consist of plastic housings (PP 15-45) available in different colors, and a contact (30 amp. for Free-mo), which is attached to the stranded wire via crimping or soldering and then inserted into the housing. If crimping, use the specifically designed crimping tool, as just squeezing them will cause them to deform, preventing insertion, and/or proper seating in the housing. Probably the best connection is obtained via soldering, but expect to apply some heat. See the links at the end for some suggestions of suppliers of the PP. 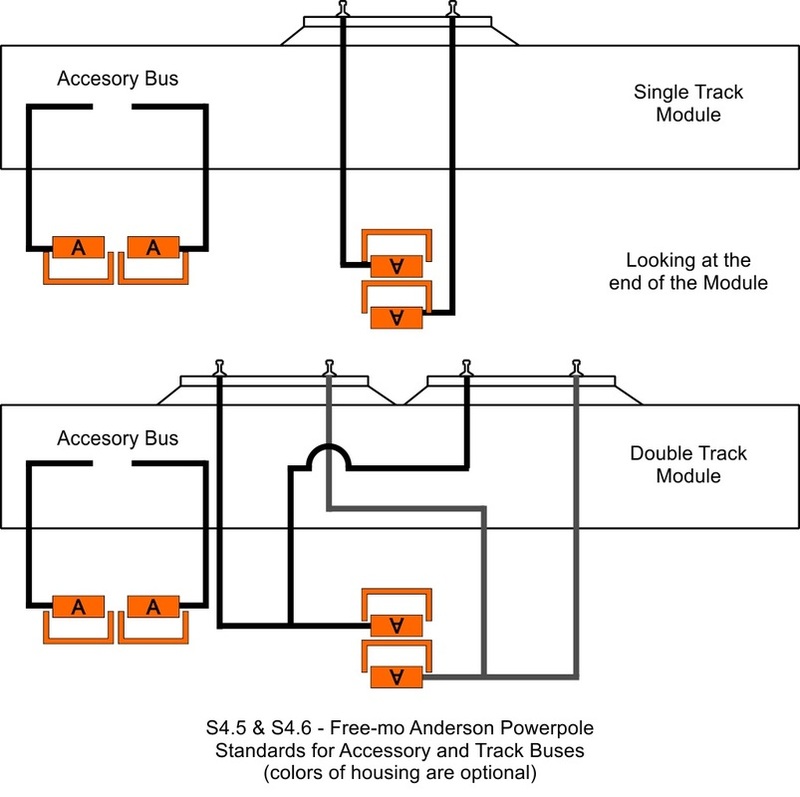 (Note that some Free-mo groups choose to specify colors for the PP housings on their different buses, none are specified in the Free-mo Standard because there is no chance to mix connections if the housings are connected as specified. The figures included here are color-coded for ease of clarity and represent the colors in use by some Free-mo groups in the Pacific Northwest and western Canada. Free-moN for example, uses red housings stacked left-over-right for the track bus and black housings side-by-side for the accessory bus. For the track bus, the PP15-45 connectors shall be stacked vertically (hood up, tongue down, Figures 2, 3A). any switch machines via the accessory bus to i) preserve the voltage of the track bus to ensure engines run reliably over the layout modules served by their boosters, and ii) so that in case of a short that causes the track bus circuit breaker to trip (e.g., engine enters an incorrectly aligned switch), the switch machine can still be operated to correct the fault. The booster common is a single wire carried through each module that provides a common reference for the boosters in a set up. Nothing on your module connects to this wire. It is terminated on each end with an Anderson Power Pole PP15-45 standard housing connector incorporating a 30 amp contact for use with 12-14 gauge wire (S4.17). The connectors for the track bus, accessory bus, and the booster common shall be three separate sets of connectors (S4.18 – see Figures 2 and 3A). The use of digital command control (DCC) makes it possible to run multiple trains in any direction and speed on the same rails. For Free-mo, “LocoNet compliant DCC and accessories are standard for interoperability within and between Free-mo groups” (S5.1). The identification of LocoNet as the standard generally means that Digitrax is the default DCC system. Note that some HO groups and other Free-mo scales use DCC systems other than Digitrax. Although Digitrax is the norm in North America, FREMO in Europe developed their own controllers (see http://fremodcc.sourceforge.net/diy/fred2/fredi_d.html - in German), and booster-to-booster network transition switches for very large layouts. 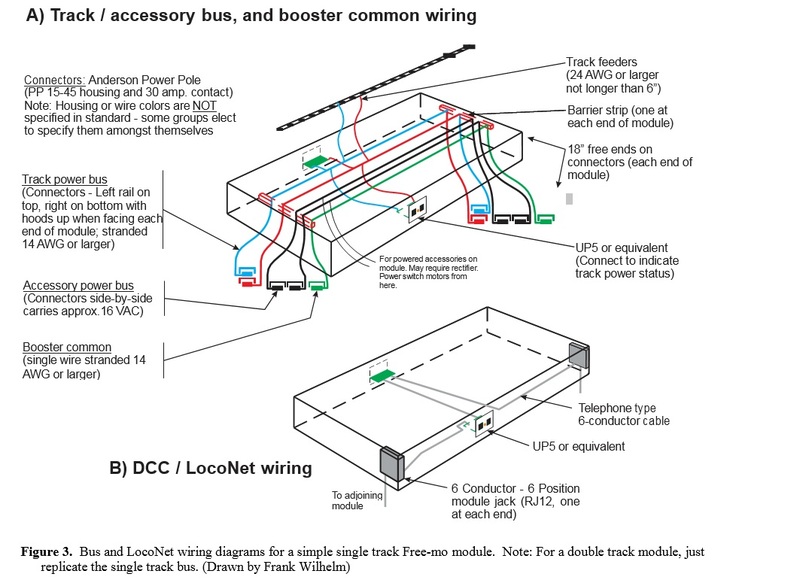 A telephone-type 6 conductor flat cable is used for the LocoNet bus. Please take note of the recommended practice (RP 4.3) that Digitrax advises against using Computer CAT type cable. We strongly recommend that you follow this practice to avoid issues at setups. See the Yahoo Free-mo discussion group (Free-mo@yahoogroups.com) for lively discussions of this topic – not everyone agrees on use of the 6 conductor telephone type flat cable, or Digitrax. At Free-mo setups, and as a standard use Digitrax components and the 6 conductor flat cable for smooth operation. All endplates to which adjacent modules connect need to have a surface mount 6 conductor 6 position module jack (RJ12) mounted to the inside (S4.7, see Figure 3B). 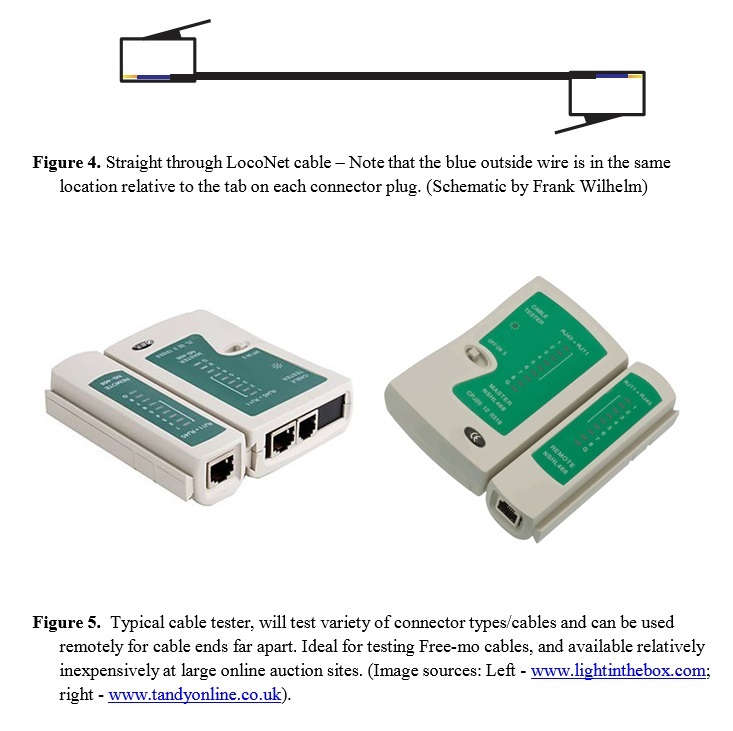 Module-to-module LocoNet connections are made with a straight-through (S4.13), 2-foot RJ12 to RJ12 type cable (S4.14) (Figure 4). Note this is not a typical phone cable (which is twisted between plugs), thus it requires purchase of cables from a vendor, or making them. If making them, use a high quality crimper to install the connectors, and test the cable with a cable tester (Figure 5) when finished. The cable testers can be had inexpensively from major online auction sites, and are worth the investment, as many setups are hampered by poor or failed LocoNet cables. To allow operation from all sides, each module has to have one dual flush mount 6 conductor 6 position modular jack (RJ12) faceplate (Digitrax UP-5 Throttle Jack or equivalent) for throttles mounted on each exposed side (S4.12). It is recommended that in areas where operators congregate (such as yards, or other high traffic areas) one or more throttle jacks should be considered (PR 4.12.1). A throttle jack is also recommended for each exposed surface of multi- section modules (RP 4.12.2). Double mainline tracks on a module are wired similar to the single track. In the simplest form, feeder wires can be taken from a single bus. Alternatively, and to assist with signaling/detection (optional at this point, but used by some local groups) separate feeders or even track buses are recommended so that detection can discern a train on either track (RP4.8.1). Controls to operate turnouts must be on all sides of a module or module section, except the end plates (S5.2). As well, all turnout frogs shall be powered (S4.10) and shall not rely on switch points to power the frog. This will ensure that all engines, no matter what their size will run smoothly over all the tracks. It is recommended that turnout controls should be mounted on the fascia, and not on the horizontal or vertical surfaces of the scenery (RP5.2.1). A variety of turnout controls exist ranging from manual (push/pull rods), to electrically driven switch motors such as Tortoise by Ciruitron, or small servos typically used in the R/C hobbies. We’ll cover the wiring of turnouts for DCC in a future note. Most modules can be easily set on a side on a workbench to allow ready access to both the top and bottom simultaneously. This greatly simplifies the wiring task. Take your time as you connect tracks and bus wires. Although you may eventually end up with a ‘few’ wires on the underside, if you pull in sections sequentially (i.e., track bus and all feeders first), you’ll be amazed at the simplicity of the seemingly complex mass of wires. Ensure you build your module to the highest standards possible, including track work and electrical. It is pretty frustrating to travel a large distance to encounter modules that do not perform according to the standards (track or electrical). Provide to others what you expect from them for flawless operations and minimum use of the 0-5-0 big hook. those that run short wheelbase engines. to the track bus, don’t count on a soldered rail joiner. owner is expected to clean their own rails to avoid damage to scenery or structures. · Keep ballast out of the rail web when you ballast your tracks to ensure good electrical contact. Anderson Power Poles: (note these are 2 part components – housing and contact, be sure to purchase both.